"Comedy history shows that it is our funniest double acts who receive the most love from the public, from Eric & Ernie and Pete & Dud to The Two Ronnies and Vic & Bob. But while all of these partnerships have been celebrated in print, one of the most beloved duos of all time – Stephen Fry and Hugh Laurie – have not. Jem Roberts, acclaimed chronicler of Blackadder and The Hitchhiker’s Guide to the Galaxy, seeks to rectify this with an all-new official biography, timed to mark the thirtieth anniversary of A Bit of Fry & Laurie. Featuring interviews with the likes of Emma Thompson and Richard Curtis, he takes a fresh look at the duo’s journey from insecure Footlighters to international comedy heroes. Beyond this, the trials and tribulations of their remarkable subsequent career paths, from QI to House, will be entertainingly explored for the very first time. Thanks to the generosity of both colleagues, the A Bit of Fry & Laurie archive has been opened up, revealing a host of tantalising titbits for fans – including what happened next for Tony and Control, which other shops Mr Dalliard’s friend ran, and the lost Laurie number The Ballad of Neddy Muldoon…"
Stephen Fry and Hugh Laurie are without doubt a central part of the British televisual canon. 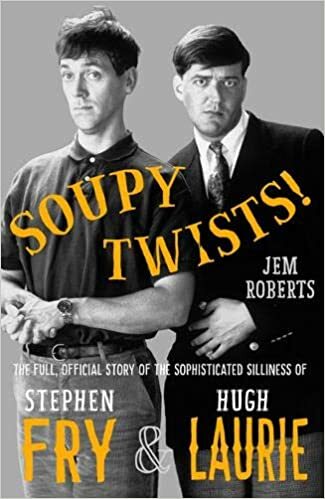 Whether your first discovery of Stephen Fry was via quiz show QI, your first sight of Hugh Laurie was in the film Maybe Baby, or indeed you encountered the two together in iconic series Blackadder, Jem Roberts deftly shows in the crowdfunded publication of Soupy Twists! how the duo rose to the top of their game - and how they've done probably an awful lot more than you realised in order to get there. Fry's sheer talent is rightly prized over the darker elements of his past, but Roberts gives both a realistic and honest treatment. Roberts also does well to demonstrate the hard work that went into the pair's meteoric ascendancy to fame, as well as acknowledging the opportunities that were available to them at various points - alongside humbler beginnings. Roberts' meticulousness as a researcher is seen front row and centre in this joint biography. His attention to detail and emphasis on first-hand accounts (from such luminaries as Emma Thompson) is what brings the recount to life, alongside a beautifully varied selection of photographs, and never-before-seen access to scripts. It is a balanced retelling that showcases Fry and Laurie's strengths and weaknesses and sensitively analyses what makes them the performers that they are today. The scripts from A Bit of Fry & Laurie will perhaps be the highlight for die-hard fans; however, for those who have seen less of the show, it may be harder to visualise the tone, gestures and overall performative style inherent therein, even if readers are familiar with the twosome's other work (both together and separately). For this reason, the book would arguably be an even greater standout hit as an audiobook, enabling the scripts to spring into full life. An ebook format would also enable links to clips at relevant moments. Fry and Laurie are themselves such animated forces on the screen (big or small) that any textual rendering is bound to feel a little flatter by comparison. Nevertheless, Roberts' exclusive insider access and expertly incisive commentary makes this book an excellent gift for any Fry and Laurie fan, especially in anticipation of the upcoming festive season (is it even legal to mention the C-word before Bonfire Night?). Soupy Twists! is entertaining, engaging, thorough and humane - and readers will surely not be disappointed. falling back instead on souls. Today's prompt suggested inventing our own poetic form. I didn't set out to, but may have inadvertently done so. I've ironically written quite a short poem today, figuring that less is more. I was inspired by yesterday's form - the Pleiade - with its seven lines, and Hortensia Anderson's additional restriction of 6 syllables per line. It occurred to me yesterday that 7x6=42, and that as all Douglas Adams fans know, 42 is the answer to life, the universe, and everything. So in reversing the form (today creating a sestet of 7-syllable lines, which I can't describe any more technically than this as the metre is so irregular), I created a short form that is actually the gateway to everything we need thanks to its 42 total syllables. You can call it the Deep Thought form if you like (as in Adams' Hitchhiker's Guide to the Galaxy it takes the computer named Deep Thought 7.5 million years to calculate that 42 is the answer to life, the universe and everything). Or one could even call it the Molybdenum form, since "The atomic number of Molybdenum is 42, as mentioned by Elliot Cooper. Coincidence? I think not, because molybdenum is a very important element for humans and plants in minute quantities for proper growth." makes our first night come back. so rational after all; we are symmetry. It may seem hard to believe - but Christmas is indeed just around the corner, at barely 8 weeks away. Shops may be cluttered now with Halloween paraphernalia, fireworks for Bonfire Night, and Thanksgiving delicacies, but several shop windows already have Christmas trees and home decorations front row and centre. It's common within the beauty industry, too, to have 'Christmas in July' showcases so that journalists can already have Christmas issues ready to go even before October. And as someone whose first baby is due today (!) I have already been making Christmas cards and buying presents, anticipating that in the blur of life with a newborn it will soon be the last thing on my mind. Luckily, Literary Book Gifts has got you covered for all the bibliophiles in your life (including that awkward uncle who can sometimes be hard to buy for). Looking through the website, I found all kinds of goodies that you could either pair with a book or would make excellent standalone gifts. Say your awkward uncle is on the especially erudite side. You could team a T-shirt themed around the work of Descartes or Machiavelli with a copy of one of the works of the great man - giving you options even if your intended receiver does not enjoy fiction. Scientist? Try Darwin's Tree of Life or Gray's Anatomy. Artist? Michelangelo's got you covered. Hipster? It's #typewriter time! Or just a grumpy old git? I especially liked the slightly sinister The End T-shirt, which reminded me of the time when my sister and I were watching the Disney movie of Peter Pan and, come the closing credits, my grandad walked past and said "This is my favourite part!" You don't even have to start with Christmas if you don't want to. If you have any male friends with Halloween birthdays, look no further than the range of creepy T-shirts, featuring illustrations alluding to Dracula, Jekyll and Hyde, Heart of Darkness, or the works of Edgar Allan Poe, to name just a few. Virtually all of the designs, in fact, seem to be available for both men and women, so you're sorted regardless of what type of book your recipient enjoys. Literary Book Gifts' range is extensive both in the titles the products reference and in the design styles - and there are a variety of colours available too. T-shirt wise my personal favourites, if I were buying for me, included one alluding to Keats' Ode on a Grecian Urn, and the T-shirt transcribing Emily Dickinson's Hope Is The Thing With Feathers (what with these and the Whitman design, there's plenty for poetry-lovers! ), as well as the wonderfully subtle Beethoven design (perfect for any musicians amongst your friends and family). All designs are created in-house and printed professionally, meaning you are getting a high-quality gift that won't disappoint, whether for Christmas, birthdays, or "just because". Sizing and fit wise, you don't have to worry. The guide shows that women's designs are available for a 34-inch chest and up, with men's shirts going all the way up to a 50-inch diameter. (Measurements for tank tops and hoodies are also listed, although sadly none seem to be available at the moment.) Once I've made a purchase myself, I'll report back in terms of comfort as well. But what if you have enough T-shirts? If you are buying a book for your loved one, what better wrapping than a tote bag? These come in small, medium and large sizes for added flexibility, with the price scaled accordingly - meaning you can watch your seasonal spending budget easily. My favourite designs here include the Jane Austen (which features the great lady's desk), the fabulously elegant Marcel Proust (whose swan design perhaps alludes to Book 1, entitled Swann's Way? ), and the bold Don Quixote (especially meaningful to me as I've recently purchased a Quentin Blake print that also comes from this novel). All of these products ship worldwide from the US at very reasonable rates - I'm located in Europe, so would have to pay the $10 flat rate (excluding any taxes/customs duties your country charges), but I have had to pay much more than this for postage of products even within Europe in the past, so consider this to be good value. And best of all? With 20% off your order thanks to an exclusive Bianca's Book Blog discount code (BiancasBookBlog20) that has no minimum purchase required, you can get your shopping sorted as of right now. You can thank me later. And Merry Christmas! OctPoWriMo 2018! Day 27: what colour is it? and also in deep blue. in whatever colour I choose. In the end, we were Impressionists. We made a palette true. to make a newer hue. they practised flying with their nascent wings. into a world unkind to weaker things. perhaps from fear of what they might unleash. In opalescing, they grew strong and bright. that colours now our every waking hour. and their true flight we never will impede. from your glow with every breath.